When it comes to purchasing your laboratory needs, you have many options. So why choose us? We offer the widest selection of safety products for workplace compliance. We are a Woman Owned, California Certified Small Business and Certified Bay Area Green Business with a Mission of Keeping People Healthy and Safe. As a small business, we connect with you on a personal level. When you call us, you can request to speak to the same person – someone who knows you. We strive to be more than just a “web store”. We provide valuable resources for different industries, including our popular chemical compatibility charts. We offer free shipping in the Continental United States on all orders over $50. CP Lab Safety has received a Congressional Certificate of Recognition for Environmental Sustainability, presented by California Congressman Jared Huffman to President and CEO Kelly Farhangi on April 4th, 2016. In addition to being a Certified Bay Area Green Business, we help our local community by volunteering at local organizations. We manufacture our signature products, including ECO Funnel® and Drum Lock Safety Clamps, right here in the USA. This helps create local jobs and reduces our carbon footprint. Many of the other products we supply from top brands like Nalgene®, Justrite® and Chemglass® are also made in the USA. We understand that everyone needs a little break. We love sending you weekly Science Jokes, and Science Christmas Carols during the holidays. We also post daily on Facebook, Twitter and LinkedIn. Our website has over 50,000 laboratory and industrial safety products, ranging from Chemical Storage Buildings to First Aid Kits with more products being added weekly. Don’t forget our gift card promotions! For every order over $250 you will receive $25 or more for one of your favorite places, like Starbucks®, Pizza Hut®, Staples® or Amazon®. Give these gift cards as prizes to your employee of the week or use them to treat your co-workers to something special! We are continually looking for new ways to make your experience with us enjoyable and seamless. Want to know our history? 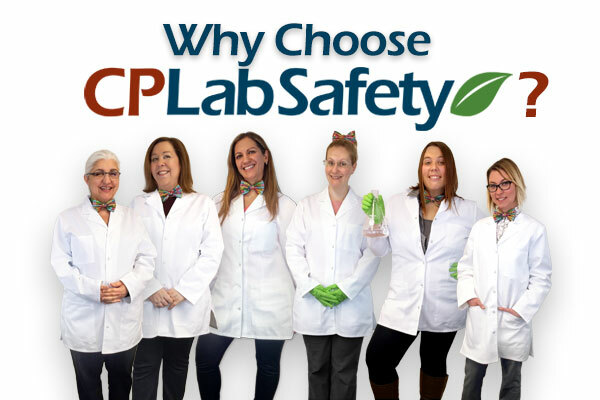 Learn more about CP Lab Safety! Thank you for your support!